Finding the Right Tools (or, Why I Love My Nook Tablet) | welcome to the janniverse. If you’ve known me a long time, it may come as a surprise to learn that I was a library problem patron. As a kid, I used to take out piles and piles of books at a time. And then I’d read them all – and return or renew them on time. No problems. I did the same with school libraries until I got to college. I may have had a fine or two in high school, but nothing serious – and no repeat offenses. Once I was working in libraries, I either returned or renewed on time – how not, when I was working in one every day? When I left library work, my only real recourse was my local public library system. Don’t get me wrong; there’s nothing wrong with my local publics. The big problem I had was that I was no longer IN a library every single workday. So I had to put more effort into remembering to renew things. Lots of times, I was good. Other times, not so much. For some reason, I was always very good about returning DVDs on time – probably because they’re non-renewable, so I know I have exactly one week in which to watch and return them, every time. Books, though…you can renew those twice, and then they must be returned. At first, I thought a $.10 fine here and there wasn’t such a big deal. But those $.10 fines add up when you forget for a week. They get even worse if it isn’t just one book. I set reminders for myself on my phone, but they disappear when you swipe them off the screen, and it’s easy to forget them if you don’t tend to them as soon as they pop up. Taking e-books out of the library eliminates that problem. When they’re due, they’re due – and they simply expire from your e-book reader of choice. No muss, no fuss, and no finding the time to get yourself to the library. No trying to remember to call the library to renew your books, either – with my library, at least, they’re non-renewable. Non-renewable books might seem like a bad thing at first. Actually, it’s not. My library system only allows me to take 5 e-books out at a time. I can choose my lending period: 7 days or 14 days. And that’s it. I have been told by lots of people that I read fast. I’ve been told this ever since I was a kid, and objectively, it does seem that this is true. Still, there’s a limit to how much I can read within a 7 or 14 day span – unless, of course, I blow off doing anything else useful. Like working. Or cleaning up after myself at home. Obviously, these aren’t things I want to do. This limitation helps me to stay focused, much the way deadlines do. When I have a set goal, I’m much more likely to reach that goal. In this case, the goal is to finish whatever I’m reading before it’s due. The limit of 5 books helps ensure that I reach that goal – and that I still have something new to move on to when I’m done reading any given book. But it also keeps me from overreaching – and simultaneously cutting off access to books for other patrons who could be reading them while they’re needlessly in my queue. Initially, as a lifelong reader, I wasn’t particularly keen on e-books. There was no political reason that I wasn’t interested. I was never, “ONOES, TEH DIGITAL CANNOT REPLACE MY BELOVED PRINT1111ONE!” Rather, I think it was the limitations of the hardware. I didn’t like the displays of the first generation of e-book readers. Call me crazy, but I was never that keen on how e-ink looked, either. And backlighting! That always bothered me, the idea that this electronic device that was supposed to better your reading life so very, very much didn’t think to include backlighting. What, pray tell, was the advantage over a traditional paper book if you were going to have to clamp a booklight to it when you wanted to read in bed? I’ve loved to read in bed since I first learned how to read, so that was a definite concern of mine. No, that first generation of e-book readers seemed like nothing more than expensive toys for bored housewives. To me, at least. Mind you, I grew accustomed to reading a LOT of stuff on my computer. I’d tried reading some e-books on my phone (and before that, my trusty old Palm Tungsten E), but that never really stuck. On the computer, I preferred to read shorter things. Newspaper or magazine articles. Short stories. Not things that required longer levels of commitment, like books. I installed the Amazon Kindle reader on my laptop, but rarely used it to read books there. It was because I recognized these preferences that I didn’t download the Overdrive Media Console (my local public library system’s preferred means of lending e-books) to my laptop. I could have, but I wouldn’t have wanted to use it. I think this is because when I’m at my computer, I tend to want to work. Whether it’s professional or personal, I largely use it for working (well, except of course for occasional stupid YouTube forays – to which I’m sure you can relate). Because so much of my work is done on my computer, I want to look at something else when I’m not working. While I love to read, this means I don’t want to be reading stuff on my computer. There’s also the fact that I do like to read in bed, and lugging my laptop (even though it’s a relatively light little thing) isn’t supremely conducive to that – especially if I want to lie on my side and read. Being a lifelong reader, I’ve also amassed more than my fair share of books over the years. I tend to only buy books that I know I’m going to read more than once, or use for reference. My collection is still huge, and could stand to be culled down a bit. E-books are a good idea for someone like me, so I can continue growing my collection and yet have less physical stuff cluttering up my space. Even with that consideration, the idea behind e-book readers was promising, but that first generation just didn’t do it for me. 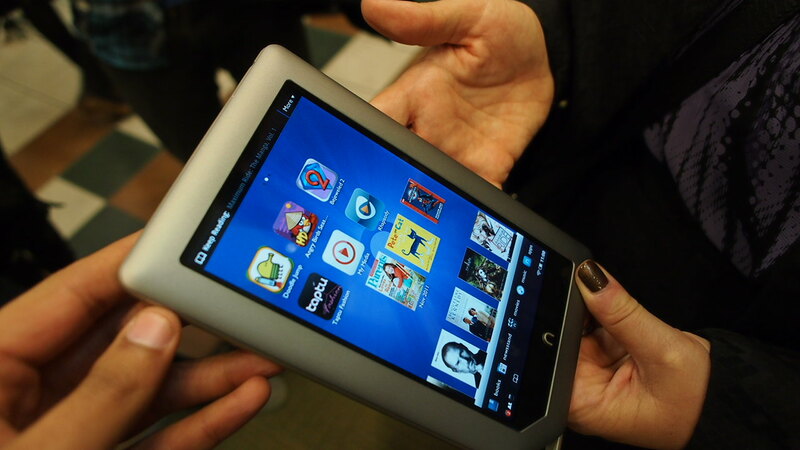 Then came Amazon’s Kindle Fire and Barnes & Noble’s Nook Tablet. Here were robust little e-book readers that were full-color, backlit, and could even do multimedia stuff like stream Netflix and YouTube and Hulu videos. Full-color e-subscriptions to periodicals, delivered wirelessly whenever new issues were released! E-mail! Mobile (but slightly larger) web surfing! Loads of other apps to sort through and use! Ah…but there’s a problem, too. By buying one or the other as-is, what you’re really doing is choosing to which ecosystem you wish to pay fealty. If you buy a Kindle Fire, the presumption is that you’ll only buy stuff for it from the Kindle Store. If you buy a Nook, the presumption is that you’ll only buy stuff for it from the Nook Store. Choice and comparison shopping are – again, presumably – out of the question. Of course, all that goes out the window if you’re the type of person who’s willing to root either your Kindle Fire or your Nook Tablet to make it a 7” Android tablet. Which goes back to my first section, where I told you about library books. An absolute must for me with any e-book reader is the ability to take out books from my library. At the time I bought my Nook Tablet, the Overdrive Media Console was not available –either for free or as a paid app – in the Nook store. I knew this was patently ridiculous, since there’s a perfectly nice OMC app that runs on Android version 2.3 (Gingerbread), which is the current architecture on which Nook Tabs run. Why did I go with the NT over the KF? There were three main reasons. One, the NT is expandable via microSDHC cards. The KF is not. I think my reasoning here is obvious, and needs no further explanation. Three, comic books look simply stunning on the NT. They don’t look bad on the KF – but taking a look at Buffy The Vampire Slayer Season Eight on a Nook Tablet did, honestly, help sell me. The comic book reader apps are nice and intuitive, too. I am a longtime comic lover (in addition to more traditional books), but fell out of the habit some time ago because I just didn’t have time to schlep to the store and pick things up. Half the fun is browsing, so becoming one of those subscription people who just swoops in to pick up their monthly allotment of comic joy every once in a while didn’t appeal. Then, of course, came the sad discovery that the Overdrive Media Console wasn’t available in the Nook Store. I’m not certain whether it’s available in the Kindle Store, but I had decided before buying the Nook Tablet that I might root it – if I had to, or if I discovered that I was deeply dissatisfied with the effective wing-clipping that B&N had performed on an otherwise swanky little beast. Discovering that there was no OMC to be had in the Nook Store was the catalyst. While rooting is legal, it’s also frowned upon by B&N, and will void your warranty. I’m not going to tell you how to do it; there are plenty of other sites to do that. But I will say that it was exactly as easy as advertised, and went off without a hitch on my very first attempt. Once rooted, I was able to access the Google Play store (formerly the Android Market), download OMC, and begin my very happy tear through my library system’s e-book collection. I was also able to download Amazon’s Kindle for Android app, the Aldiko Reader, CoolReader, and a host of other useful things to which I wouldn’t otherwise have had access. I understand that B&N wants Nook buyers to purchase content from the Nook store. That is, after all, how they make their money. But setting up a closed ecosystem where readers can ONLY buy things from your store just makes them frustrated, angry, and willing to go elsewhere – especially if your store offers a smaller number of options when compared with other stores. If you’re not willing or able to root your NT or KF, the Kindle Store indisputably offers a much larger selection of apps to suit your fancy. I’m sure a lot of people have chosen the KF for exactly that reason. Plug, play, done. Apple’s built an empire on society’s preference to do exactly that. I’ve bought books and apps from the Nook Store, Google Play, Smashwords, and the Kindle Store. And I’ll continue to do so, because I love books, love reading, and love having a sea of choices from which to choose. Since rooting it, I also completely adore my NT. Some people may think 7” is a great size for an e-book reader, but not so much for a tablet. I disagree, but my perceptions are admittedly somewhat skewed. I have small hands, and my everyday computer is an Asus Eee PC, which has a 10.1” matte screen. A 7” tablet fits nicely between the size of my computer screen and that of my smartphone. In fact, because of the size of my computer screen, I honestly think I’d be annoyed with a larger tablet – too much like doing work! I’ve had no problems watching videos via YouTube, Netflix, Vimeo, and Comedy Central on my NT. Since rooting it and installing the Perfect Viewer app, it’s also quite nice for viewing photos I’ve taken with my digital camera. This makes it easy to show friends, family, and acquaintances while on-the-go – and I don’t have to take my computer with me to do it. The display is sharp and crisp, and the colors are beautiful. I have a few most-used apps, though – two of which came from the Nook Store. If you cook, you may already be familiar with Pepperplate. If you cook and haven’t heard of it, I don’t believe I’m overstating my case when I say that it may, in actual fact, change your life. While it’s true that a good portion of my print book collection is devoted to cookbooks, I also have any number of magazines, catalogs (I’m looking at you, King Arthur), and stray recipes on little pieces of paper that have drifted into my life. I used to keep those extraneous pieces of paper in a file folder. Unfortunately, as it grew, it became more and more unmanageable. I’d kept those recipes for a reason, but it was extremely demoralizing to try to navigate this completely unwieldy folder. I would also save magazines and catalogs for recipes – only to never actually access them again, because I couldn’t remember which issue held which recipe. You can see where this could be a problem. Pepperplate is a cross-platform app that allows you to import recipes either automatically or manually from websites. You can also use the manual feature to type in any recipes you have lying around – like my infamous folder of strays, as well as my magazines and catalogs. You can tag them any way you want so you can easily search your recipes later. Pepperplate will also create shopping lists for you based on any recipe you choose. There’s also a meal planning feature, so you can decide what you want to cook when and schedule yourself accordingly. In short, it’s brilliant. I use it all the time when I’m cooking. I simply prop my NT on a copyholder on my kitchen counter, then use my recipes in Pepperplate. Unlike when I used to plop my laptop on the counter, I’m not terrified that if I get a little flour in the keyboard, I’m going to completely ruin my main means of making a living. Pepperplate syncs your recipes with any/all devices on which you choose to use it. It works as intuitively and quickly as I feel it should. So far, I’ve been nothing but pleased with it – and will be even more pleased when I finish manually inputting all my paper recipes. Another app I use a lot is Taptu, which is a social newsreader app. Before, I tried to keep up with RSS feeds via Google Reader. Google Reader is fine, as far as it goes, but it becomes really laggy if you follow (and navigate) a lot of feeds – which I do. I’m interested in a lot of things, and in order to be a halfway effective writer, I need to keep reasonably current on things in my fields of interest and/or purported expertise. Taptu is brilliant. Its tagline is “DJ Your News,” because you can merge multiple streams together to create one mega-stream to follow. Say you’re interested in wine, and you follow a bunch of wine blogs and magazines. You can create one mega-stream about wine, so you don’t have to individually navigate each stream from each source. It’s brilliant. You can aggregate your streams in whatever way makes the most sense to you. Honestly, I don’t know how I dealt with all my feeds before using Taptu – probably because I didn’t. I’d occasionally check them, but get completely frustrated with how long it took me to access things, then share anything I wanted to share, and finally go back to the main list of articles so I could decide what to read next. Taptu makes it fast and simple. Perhaps it was asking too much to expect other readers to move as quickly as I can read – but Taptu does. It’s something I really, really appreciate – and something that I think has greatly enhanced my ability to both read and share information online. As for Google Play apps, a home screen switcher of some sort is a must when you root. It’s the easiest way to go back and forth between your standard NT home screen (and ensuing apps installed) and all the stuff you install using Google Play. Other apps I love from the GP store include the aforementioned reader apps, the official eBay app (seriously; it’s the only way I browse eBay now – MUCH nicer than on my computer), the TED talks app, Titanium Backup, App2SD Free (which lets you move apps to your SD card, freeing up internal space on your NT), and Tweetcaster – just to name a few. Still navigating through garden planning apps at this point; while I’m an avid gardener, I’m also very particular, so I need to do a little more research to decide what I want to install. But I have options, and that’s really the point, isn’t it? My main point in writing this exceedingly long entry is that, when inviting any piece of new tech into your life, the most important thing of all is figuring out what will work best for you. Don’t let yourself get roped into the cult of shiny-for-the-sake-of-shiny. Do I love shiny new gadgets? Of course I do. But I only really and truly love them if I know that they and I are going to live happily together for a good, long time. I know that eventually, we’ll part ways. But I want something that will help me be more productive and will enrich my life for the foreseeable future, each time I make that choice. I tend to research the hell out of anything and everything, if given half a chance. This goes double for anything major that I’m considering buying. In this case, I’m happy to say all that research has, so far, paid off handsomely. Does this mean I’d urge you to run out and get a Nook Tablet? If you’ve determined that it suits your needs, absolutely. It’s a fine and solid device. (For parents of human kids: from what I understand, it also has a slight edge over the KF with children’s books, but I haven’t personally used it for those.) I’d never suggest it if you haven’t determined that it’s the right device to suit your needs, though. Do a little research first, and decide what would be most useful and/or make you happiest. Then go for it.